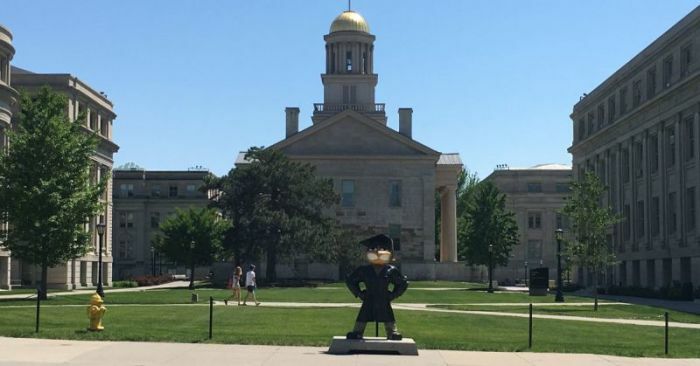 An InterVarsity Christian student group is suing the University of Iowa after the school kicked it and several other religious groups off campus over what has been deemed as discriminatory leadership policies. InterVarsity Graduate Student Fellowship filed a federal lawsuit against the university Monday after the club was de-recognized as an official campus student group last month because of its policy requiring that all group leaders be Christian and sign a statement of faith. InterVarsity is not alone. The university also expelled 37 other student groups that upheld similar requirements last month, including the Chinese Student Christian Fellowship, Young Life, the Latter-day Saint Student Association, the Imam Mahdi Organization, and the Sikh Awareness Club. InterVarsity, which has been on the Iowa City campus for over two decades, has a history of being welcoming to all students but requiring those who want to lead the group to comply and uphold the faith. Throughout the spring semester of last year, the school administration pressured student groups to change their leadership policies so that they are in compliance with the university's human rights and discrimination policy. The student group told the university that it wanted to have policies that reflect the importance of Christian leadership. According to the lawsuit, the school administration warned that it could not allow the group to have "a restriction on leadership related to religious beliefs," and that the group could not encourage its leaders to agree with the InterVarsity statement of faith. After InterVarsity and the other groups refused to change their policies, the university formally moved in July to derecognize those groups. "We're grateful to have been part of the university community for 25 years, and we think that the university has been a richer place for having Sikh, Muslim, Mormon, Catholic, Jewish, atheist, and Christian groups," Kristina Schrock, student president of InterVarsity Graduate Christian Fellowship, said in a statement. "Because we love our school, we hope it reconsiders and lets religious groups continue to authentically reflect their religious roots." InterVarsity is being represented by the Washington-based religious freedom law firm Becket. In a statement, Becket attorney Daniel Blomberg asserted that booting religious groups off campus for requiring leaders to uphold the faith is not the way any university will "foster an intellectually diverse environment." "Universities should allow students the space to form their own groups that challenge and grow their sincere beliefs," Blomberg said. "Banning religious groups from having religious leaders just flattens diversity and impoverishes the campus." The university's decision to derecognize the 38 student groups comes after a federal judge ruled earlier this year that the university unfairly enforced its human rights discrimination policy when it expelled the student group Business Leaders in Christ from campus last year while other groups were not subject to similar enforcement. A federal court gave Business Leaders in Christ a temporary injunction to have its banishment lifted through the spring semester. In June, a federal judge rejected the university's request to again de-recognize the group because it still hadn't applied the policy fairly. Because the court order blocks the school from deregistering Business Leaders in Christ, Business Leaders in Christ is now the only university-affiliated student group that remains out of compliance with the university policy. "There is pending litigation involving BLinC, and the federal district court has ordered the university to maintain BLinC's registration status until the conclusion of the litigation," university spokesperson Anne Bassett told The Gazette. A jury trial is scheduled for March 2019 in the Business Leaders in Christ case. Non-religious groups that have been de-registered by the university are the Iowa American Student Dental Association, National Association for the Advancement of Colored People, Association of Nursing Students and Medicine, Education and Development for Low Income Families Everywhere. The Christian Post contacted the University of Iowa for comment on the lawsuit. A response is pending.